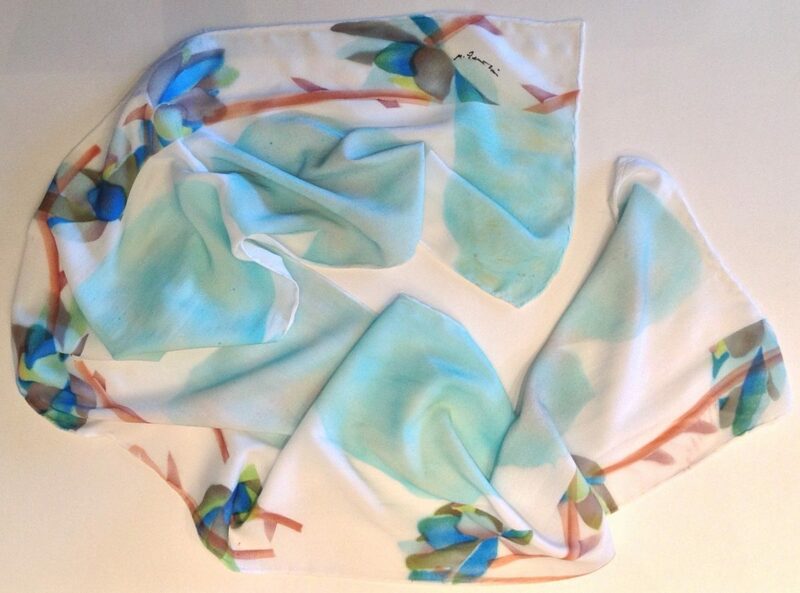 A rayon bamboo blend scarf, with Lotus blossom, leaf and branch images, in turquoise, cobalt blue, sienna and yellow, this airbrushed scarf measures 158cm x 26cm. 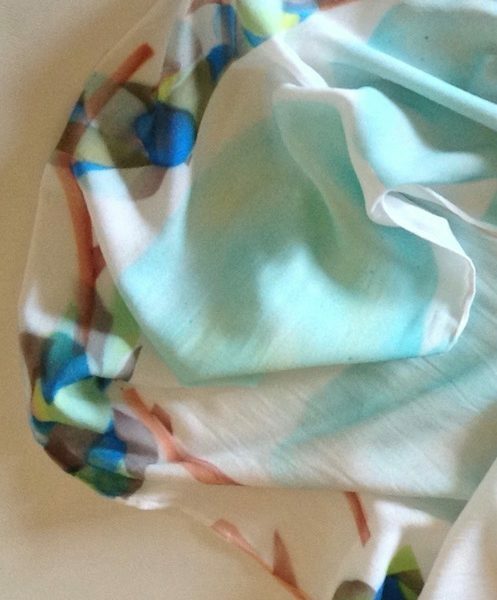 A rayon bamboo blend scarf, with Lotus blossom, leaf and branch images, in turquoise, cobalt blue, sienna and yellow, this airbrushed scarf measures 158cm x 26cm. It truly is a piece of wearable art! 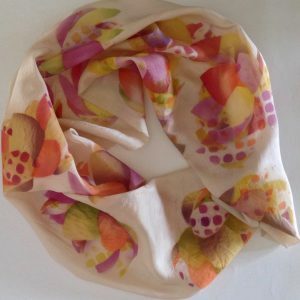 This scarf is signed by the artist, Maija Zemitis. It is my hope, that the woman who owns one of my scarves feels that she has an item that is something completely exclusive. Wearing this piece of wearable art often and in various situations, whether at work or at play shows an expression of her individuality. 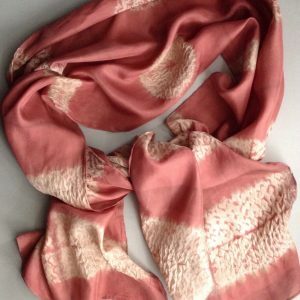 Scarves are an inexpensive, feminine and classy accessory any woman can use. 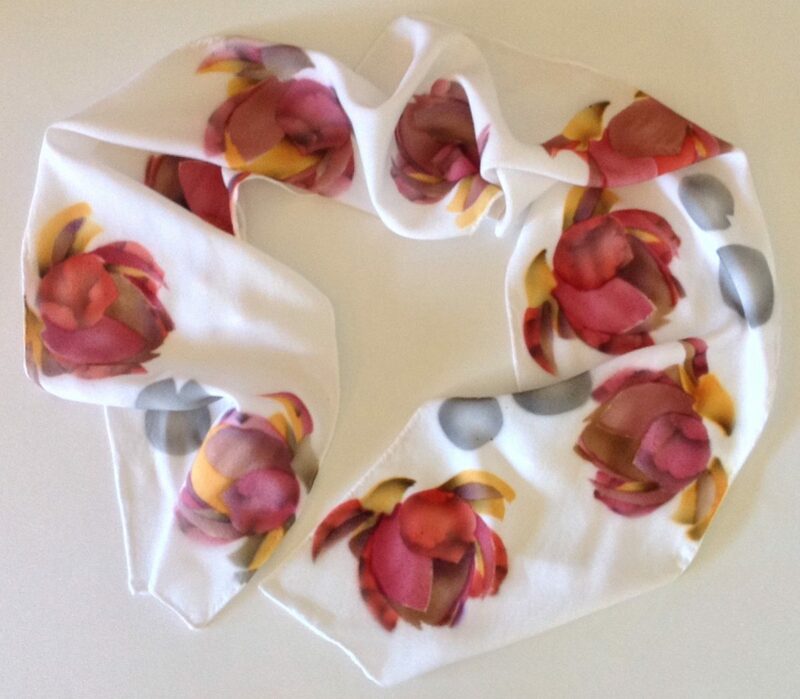 My scarves are designed in a large variety of colours and styles. I use different fabrics (silk, cotton, linen). 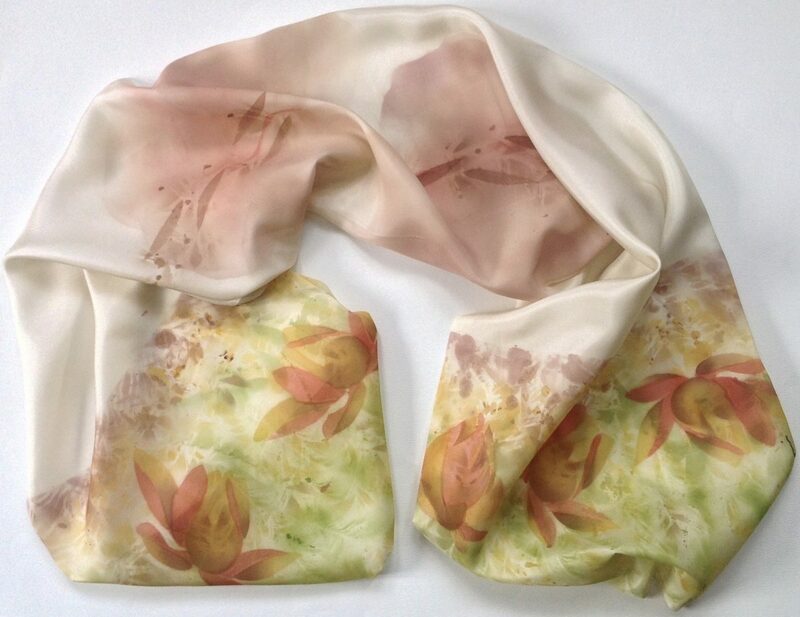 Use my airbrushed scarves in several ways. “Big Blue” can compliment a blouse, dress or jacket. It can be tied in all manner of ways. Scarves enhance any outfit and make compelling fashion statement. It is my hope, that the woman who owns one of my scarves feels that she has an item that is something completely exclusive. I studied at Montreal Museum of Fine Art, School of Art & Design and later went on to study Fine Art and Art Education, at University. My main interest, at the time was silkscreen. Later, I returned to Ontario, where I enrolled in a course in Surface Design at OCA, in Toronto. Silkscreen printing was the technique used. During a recent trip to India, which also included a short textile tour, I sought out textile artists, with whom I maintain contact. Following awe-inspiring trips to Thailand and India, in recent years, my theme of choice is the Lotus blossom. In Hinduism and in Buddhism, the lotus flower represents purity of body, mind, and spirit. 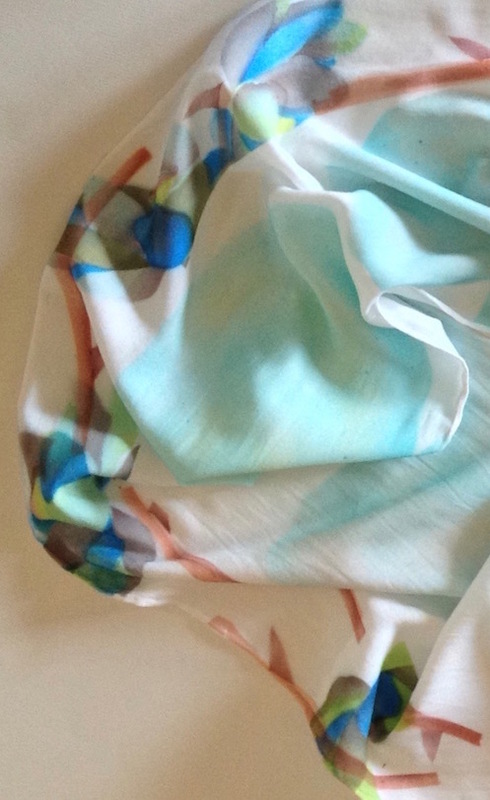 To keep this scarf in pristine condition, wash it in warm or cold water, using mild soap. Then hang it to dry. After drying, the scarf should be ironed on the unpainted side of the fabric.